The 6.7-liter ISB straight-six turbodiesel engine is the last and largest version of the B series. ISB6.7 is also the largest and powerful diesel engine for light and medium duty pickup trucks produced by Cummins (350 hp and 650 lb-ft of torque). The previous turbodiesel the ISB 5.9 has been produced almost ten years. It was outdated at that moment and depleted the limits of possibilities for work on fuel consumption and emissions. The market needed in a new engine for medium duty trucks and buses. The 6.7 ISB had an increased cylinder bore (4.21 inches or 106.9 mm) and piston stroke (4.88 inches or 124.0 mm). These dimensions allowed an increase in displacement to 6.7 liters (408 cubic inches). The engine block is made of cast iron as before. On top of the block is a 24 valve cast iron cylinder head similar to the ISB5.9 head. The difference between ISB 5.9 and 6.7 cylinder head is the ISB6.7 head has holes (Sensor Hole Style head) from the air intake plenum side. There are many changes over the previous 5.9 liters engine, but in general technical part of the engine is the same as the last generation of B5.9. The engine had high-pressure Common Rail fuel injection system, electronic fuel injection pump, and new equipment for emissions reduction. The new version was designed guided by stricter requirements on Federal emissions regulations. When it was released in 2007, the engine was the first Cummins diesel equipped with a diesel particulate filter (DPF), which cleans the exhaust gases from more than 90 percent of soot. A diesel particulate filter has a ceramic matrix, which filters soot particles and regenerates them under high temperature, heated by exhaust gases. Also, the engine had the exhaust gas recirculation system (EGR) with cooling. In 2010 model year the engine received in an additional DEF (diesel exhaust fluid), SCR (selective catalytic reduction), and EGR cooler that cools EGR gases. DEF is injected into DPF to help regeneration process of soot at the lower temperature. So 2 liters of DEF is consumed for every 100 liters of diesel used. Holset HE351VE variable geometry turbocharger (VGT) is another interesting new feature of the engine. This turbocharger can block exhaust flow to increase temperatures inside the DPF, which reduces emission levels. The VGT also has the integrated exhaust brake function. It does the engine braking by restricting exhaust flow. All ISB6.7 engines are equipped with an air-to-air intercooler. The work under modernization has never been stopped during the last ten years of production, so the 2017 model year engine produces up to 900 lb-ft of torque. The ISB6.7 also was laid into the basis of the smaller version - ISB4.5 - 4.5-liter straight four cylinders turbodiesel. Direct injection, electronically controlled Bosch high pressure common rail injection. 15,000 (24,000 km) or 6 month (7,500 miles or 6 months for 2007.5 - 2012 model years). 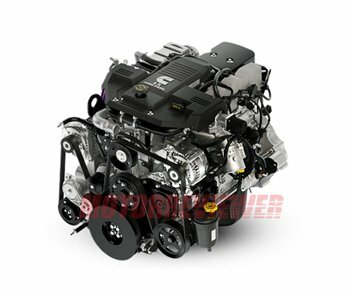 The 6.7 ISB has become the most reliable Cummins B engine to date. In stock form, the failure rates are meager. The common problems are related to emissions equipment and common rail injection. EGR system is prone to clogging as in other engines equipped with EGR. Longevity of DPF is about 100,000 miles. Some owners buy DPF delete kits out on the market, which undoubtedly cheaper, but less friendly to nature. Fuel injectors also demand attention on 200,000 miles, but there is an opinion that 6.7 injectors are more reliable compared to 5.9 ISB common rail injectors. The long idle times is not good for the VGT. In 2007 the 6.7 liters engine was introduced in 350 hp and 650 ft-lb version with Chrysler-built six-speed 68RFE automatic transmission, and 350 hp and 610 ft-lb modification attached to the Mercedes G56 6-speed manual transmission. The 2007 and newer 3500 trucks had only 305 hp and have being equipped with the Aisin AS68RC or the Mercedes G56 6-speed manual transmission. The 2008 4500/5500 medium duty trucks received the 350 hp and 610 ft-lb version of the engine, which come with the Aisin AS68RC or the Mercedes G56 manual. Since 2011, the 68RFE automatic transmission offered with 350-370hp and 800 ft-lb version of 6.7 liter engine. Since 2013, the Aisin AS69RC transmission became available for 3500 only with B6.7 engine produced 385 hp and 850-900 ft-lb of torque.